Dangerdog HQ has had an abundance of classic hard rock and heavy metal pass over the desk this week. 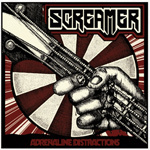 Sweden upstarts Screamer, and their debut Adrenaline Distractions is another fine example. 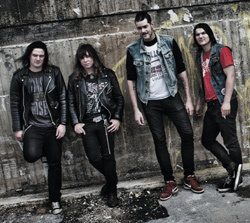 They offer brisk metal with a strong rock groove, supported by a rough and tumble rhythm section and peppered with fine guitar work. Above, Screamer: Leather, check! Denim, check! Funky sneakers, check! Let's rock! When first listening to Adrenaline Distractions, particularly the first two tracks Can You Hear Me and Rock Bottom, I thought I was hearing simple hard, or heavy, rock. But it's more of a metal rock groove. The other thing that struck me was how precise the performance was on both songs. The musicianship seemed terribly over-rehearsed, and so distracts from the raw quality we expect from hard rock or heavy metal. But ultimately, this is not the case for the whole of the album, as it does have a rough, stripped down, sound. But then, with the song Screamer, there's seems to be a turn. This song brings speed metal to the forefront and more than a little subtle reference to early Motorhead. It also ups the urgency, and directness, in the album. The following Adrenaline Distractions and Keep On Walking are swift, heavy and rocking. Also, Keep On Walking, All Over Again, and I Know prove that Screamer knows that a good rock groove and a metal edge are made better by some good hooks; these songs have them. Some simple final thoughts, and then a conclusion: first, the rhythm section delivers a steady foundation, especially the bass line. Second, the fret work, while traditional, is lively and effective. Ultimately, Screamer has the goods for melodic, and muscular, heavy rock and metal, with raw urgency and vitality as their best qualities. Recommended. On Adrenaline Distractions, Sweden's Screamer delivers classic, and muscular, melodic heavy rock and metal. They're certainly on the right course.